Joining an outback camel trek, Alexis Buxton-Collins steps back in time for a digital detox in South Australia’s Far North. I’m somewhere near Hawker when the FM stations begin to dissolve into bursts of static. The small town 400 kilometres from Adelaide is best known as the gateway to the Flinders Ranges, but instead of turning off I continue north. The jagged crown of mountains that forms Wilpena Pound emerges and soon disappears on my right, and I note with pleasure that the school holiday traffic quickly thins out. I’m trying to escape the modern world for a few days, and what better way than on a mode of transport that became outdated almost a century ago? My destination is Beltana Station, a large property that helped to open up Australia’s interior as the first camel breeding centre in the country. When I arrive at the homestead, I’m surprised to discover that my phone still has a weak signal (thanks, Telstra). It’s not the ideal start to a digital detox, but I fire off a few quick emails as I wait for the other guests to assemble and soon we’re all headed down to a campsite not far from the station. The last vestige of mobile reception disappears and though I suspect I could re-enter the modern world by climbing back up the hill, I’m more interested in getting a quick lesson on how to set up my home for the next four nights. It takes approximately two minutes to learn all there is to know about swags, and soon I have a cup of tea in hand as I get to know my fellow camel trekkers. Among our group we have a retired teacher who breeds horses in Gippsland, an actress from a prominent Australian television series and a couple from New South Wales’ Southern Highlands, a lawyer and a nurse. If you’re ever in need of an icebreaker, go straight to the nurse – over the next four days she proves to be an endless font of stories that combine equal measures of hilarity and horror. For entertainment value, they put my Facebook feed to shame. In the morning we meet Karen Ellis, who runs Camel Treks Australia with her husband Paul, and she introduces us to our mounts. She insists that each of the dozen camels has a distinct personality but all I can make out is a white one, another that emits startlingly loud belches and gurgles as I approach, and ten other similar looking animals. I decide it’s best to let Karen choose my mount and she pairs me up with Ava, a no-nonsense beast who waits until I’m ready before lurching abruptly upwards. That’s when I notice for the first time just how much taller camels are than horses. Perched on her hump, I have an excellent view of the hills at the far northern extreme of the Flinders Ranges around me. Gentle slopes dotted with pincushions of saltbush lead up to exposed ridges glowing a gentle red in the morning sun. Our path lies lower down, along the sandy creek beds that cut a swathe through the hills and support more substantial greenery. There, the boughs of ancient red gums protect us from the unseasonably warm autumn sun, their ghostly white trunks peeling like old paint to reveal shades of deep earthy brown and vibrant red. Over the next few days I settle into an easy routine, watching the sunrise bring the landscape to life from my swag before joining the others for a camp breakfast. Instead of checking a weather app and looking through my emails, I scan the duck egg blue sky for clouds and ask how everyone slept. We alternate between riding the camels and walking alongside them for two hour stretches, drifting in and out of conversations and listening to snatches of birdsong as wedge-tailed eagles wheel overhead. Beyond the creek bed, the landscape turns into barren looking gibber plains and far off in the distance, the hulking mass of Mount Deception slowly turns from blue to purple and finally a warm orange as it catches the afternoon sun. When several of us spot what looks like a plastic bag high up in the branches of a gum one morning, there’s no Google to help us identify it. Instead, outlandish theories are proposed throughout the day before Paul informs us around the evening campfire that it was a mass cocoon containing hundreds of processionary caterpillars. Dinners are communal affairs and the conversation meanders in unexpected directions. The campfire’s warm glow replaces the soft blue light of the screens I’m usually tethered to and instead of digital interruptions, we cry out when shooting stars arc across the veil of the Milky Way. It’s a life I quickly get used to, and I soon find myself wishing I’d booked one of the longer trips. But soon it’s over and as our group prepares to part ways, we fire up our phones once again to swap details and exchange photos. We talk about how much we’re looking forward to the luxury of showers and real beds. But as everyone leaves and I watch the sun set from the station, I’m happy to turn my phone back off and have just one more night away from the modern world. 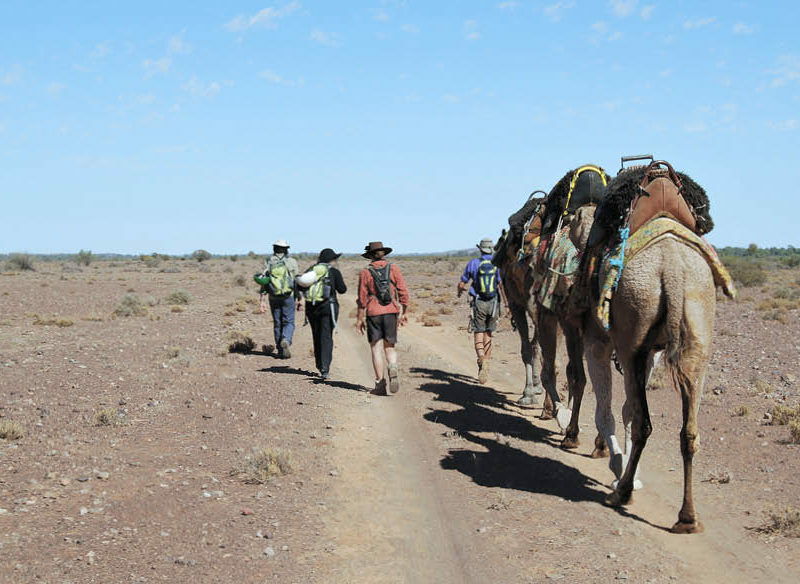 Camel Treks Australia runs three to 15 day-camel treks departing from Beltana Station between April and October. A four-day/four-night trek costs $1680 including a swag, all meals and wine in the evenings. Beltana Station is 530 kilometres north of Adelaide, accessible via a six kilometres dirt road from the highway that is suitable for 2WD vehicles. A bus runs between Adelaide and the Beltana turn-off twice a week, charging $135 one way/$340 return for camel trekking guests. 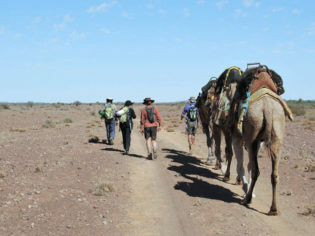 Trips are timed to coincide with this schedule and Camel Treks Australia will pick up and drop off guests.